Replacing outdated hydro poles on Vancouver Island is a two-part process that sees local beekeepers hovering close by, ready to relocate the colonies that call the cement poles home. 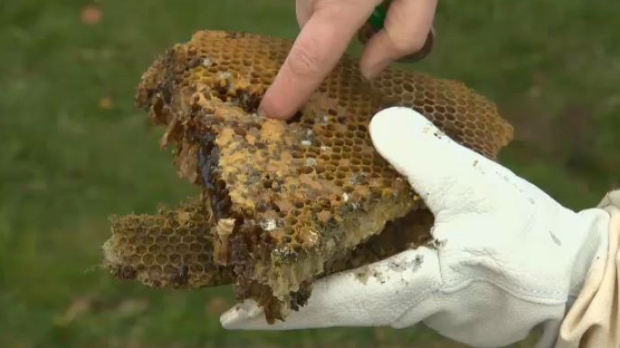 Island beekeepers are working closely with BC Hydro during the removal of hydro poles, which began Wednesday, to ensure the safe rehoming of the numerous bee colonies, which seek shelter in the hollow poles. It was a disappointing day for those involved when the bees, which called the pole home for five years, were gone. The South Island’s high humidity and cool temperatures pose a threat to resident bee colonies that struggle to survive the drastic changes in temperature. That, coupled with the rising wasp population, is putting stress on bee colonies through the fall. "If we get snow in late February, I suspect half of the colonies in Victoria may collapse in March because they’re just not able to handle that kind of weather differential,” said Denluck. Denluck, along with other local beekeepers are planning to analyze the comb, measuring honey and testing for viruses, in an effort to determine why it was abandoned. They also plan to be on site for the remaining removals, ready to rehome any surviving bees. It’s rare for colonies to survive without the assistance of beekeepers, so they’re asking island residents to help out.